The 11th Piazza Italia festival roars into Horsham town centre this (Good Friday) morning, with more new features and surprises to attract and entertain the crowds. The firm favourites such as iconic Ferraris, special Supercars and mouth-watering markets will of course be making a welcome return, but there are plenty of new attractions making a debut this year. Here are the Top 11 things not to miss. 1 - Fashion Shows at 11am and 2pm featuring some stand out clothing ideas for Summer for men, women and children from M&S, Jigsaw, Gerry Weber, La Vida and JoJo Maman Bebe, all hosted by Dave Benson Phillips. On Easter Monday at Parkside (Council Offices). An F1 simulator with a chance to win a pair of Silverstone British Grand Prix Sunday tickets for the fastest lap time of the day. Piazza Italia’s first ever Bugatti Veyron. This year, the Horsham Street Singers Opera, will celebrate Italian culture and music as part of the festival. But the Piazza Italia organisers are also looking for Horsham’s hidden talent... are there any undiscovered Pavarottis out there? Who in Horsham can hold the longest note, the loudest shriek, the most high pitched note.... etc? A team of dedicated singers will be around, during the day, seeking the best opera singers Horsham has to offer. The best of the best will be invited to the bandstand to compete in final where there may even be a chance to win a prize. The day will culminate with a spectacular sing-along finale on the Bandstand once the cars have departed. 4 - It’s Fun with Food on Easter Saturday (Carfax). Chefs from the local market and the visiting Italian market will showcase their wares while being ‘interviewed’ by comperes Tony and Tim. There will also be a singing chef, demos from local businesses and a surprise visit from Chef Brothers ‘Jake & Sidney Pie’ featuring juggling, mess, trickery, more mess, comedy and probably more mess! 5 - The Toy Barnhaus Children’s Zone (The Forum, Easter Saturday). Saturday has always been packed with things to do with the kids and this year there is even more entertainment with the ‘Messy Church’ Activity Tent, Jumpin’ Jockey’s riders and Children’s rides from M&L. 6 - Friday’s Two Gentlemen of Horsham (Carfax and around town). Come along and discover a lost Shakespearian play, being performed outdoors in Horsham to celebrate Horsham’s Piazza Italia Venetian Day – The Two Gentlemen of Horsham (adapted loosely from Shakespeare’s Two Gentlemen of Verona). The story revolves around an Italian merchant living in Crawley and wanting to move to Horsham and who knows how the story will end! 7 - Mask up on Good Friday. Friday is Venetian day with a masked theme going on in association with the Non Stop Party Shop who have a range of beautiful ready-made masks for all tastes. Look out for the roaming gondolier. 8 - The Kwik Fit Safety Zone (every day in the Carfax by Paninos). This year Kwik Fit are offering even more road safety information and the chance to win prizes, including free servicing alongside partners Sussex Safer Roads Partnership, the Institute of Advanced Motoring and SERV Sussex. 9 - The Sporting Bears Dream Rides (Friday and Monday from Brock Taylor, East Street). The Sporting Bears return to Piazza Italia with an even greater selection of cars promised from which to choose your dream ride out. All donations are split across Piazza Italia’s three children’s charities. 10 - Good Friday is now Italian Job Mini Day (Bishopric). 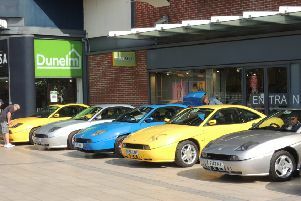 The Minis which have proved such a popular feature of Piazza Saturdays have moved to Good Friday. The Italian Job.com charity, who create annual road trips to and from Northern Italy by Mini in homage to the film, will add some sure-fire fun to Ferrari Friday. 11 - The Piaggio Prosecco Bar (Carfax all three days). The first prosecco bar is available for anyone fancying a few Italian bubbles to make their day go even more smoothly. We will be aiming to hold a Facebook Live from the Carfax this morning - check out our West Sussex County Times Facebook page.